Last week, I headed to the swanky Microsoft loft in Manhattan to play Quantum Break, the upcoming Xbox One and Windows 10 exclusive from Remedy Entertainment, creators of Max Payne and Alan Wake. With the game this close to release—it launches in less than a month—the press was given free rein to play through the first two hours. Though I now have a greater understanding of what Quantum Break actually is, I left the event just as fascinated with this project’s continued existence as I’ve been since it was revealed in 2013. On its face, Quantum Break is a standard Remedy third-person shooter. Jack Joyce, played by Shawn “Iceman” Ashmore, gets caught up in a time-travel experiment gone wrong, and on the behest of his brother (Dominic Monaghan), sets out to fix the damage this catastrophic event has done before it destroys time itself. Opposing him is Paul Serene (Aidan “Littlefinger, if you’re nasty” Gillen), Jack’s former friend who built the time machine, caused the coming time apocalypse, fled into the future, and returned to the present as the leader of the mysterious and murderous Monarch Solutions corporation to avert the end of time—by any means necessary. Here’s where things get weird: At the end of the each of the game’s chapters, you take control of Paul Serene and are forced to choose between two options for how the story will play out. After that, you’re treated to 20 minutes of Syfy-caliber live-action television. They’re essentially episodes of a Quantum Break TV show that depict the stories of the game’s villains and secondary characters. They’re meant to humanize them, fleshing out the narrative in ways that, according to the game’s director, Sam Lake, couldn’t be done without the live-action episodes. As Lake tells it, though, the show wasn’t always envisioned as a vehicle for character development. It grew into that role as the project evolved. Prior to the launch of the Xbox One, Remedy had approached Microsoft with a pitch for Alan Wake 2 that, in some capacity, integrated a live-action show of its own. But that was the Microsoft of 2012, a company determined to market its console as a multimedia monolith first and a games machine second. The Microsoft of 2016 has largely abandoned those aspirations. The “entertainment” branch of the Xbox division—responsible for developing original, Xbox-exclusive video programming—was shut down in 2014 and the new head of Xbox has openly condemned that entertainment-centric approach. 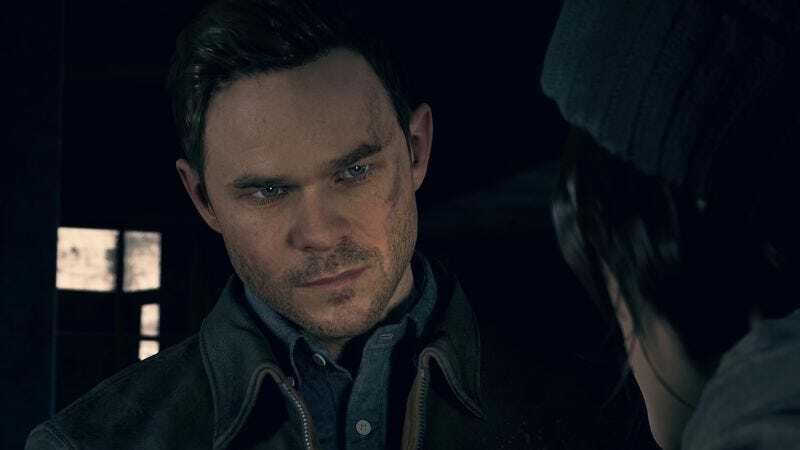 Quantum Break made all the sense in the world when it was conceived in 2012, but now it just feels like a questionable experiment that flies in the face of trends favoring pared-back storytelling. It’s a relic of an abandoned Microsoft agenda that might not get made if it were pitched today. At the same time, Quantum Break has somehow come to represent a bold step forward for Microsoft’s gaming wing. It’s the first major console exclusive to launch simultaneously on Xbox One and Windows 10 PCs as part of the company’s attempt to break the wall between its two game platforms. (Though the execution of that effort, thus far, has had at least one high-profile developer crying “monopoly.”) Hinting toward future steps for that initiative at a recent press event, Phil Spencer, the Xbox division’s head honcho, mentioned that Microsoft might start rolling out upgraded versions of the Xbox One on a frequent basis to combat the console’s technical inferiority, as opposed to making single significant leap to a brand new box further down the road. And because it’s all running on the same software—whether it be a PC, a current Xbox One, or some hypothetical souped-up Xbox One.3—all the games would just work on everything in perpetuity. That’s the plan, at least. The only thing certain about the future of the Xbox One is that Microsoft is thinking about taking it into uncharted territory. Switching to a model that’s somewhere between Apple’s annual iPad upgrades and the traditional five-or-more years between consoles would be an unprecedented change, if it’s a strategy that sticks. We might never see another true “console generation.” And leading us down that potential road is Quantum Break, a total aberration that, like its characters, is unstuck in time, plucked out of the past and somehow made the beacon of an unknowable future.